We still believe that there is potential to develop a wind farm with fewer turbines on the Pairc Estate. We are exploring opportunities to transfer interests to another developer. "The Pairc application is on hold pending information from the applicant (Scottish and Southern Energy) on whether it wishes to proceed with the application..."
"...However, if Pairc wind farm were to be included in the cumulative assessment it could not be ascertained that the combined effect of both Stornoway and Pairc would not adversely affect the integrity of the Lewis Peatlands SPA. Pairc wind farm contributes nearly 50% of the total predicted collision mortality of Golden eagle as indicated in the table above. Should Pairc proceed to determination, this will require a new Appropriate Assessment and cumulative collision mortality assessment from all proposed and consented wind farms in the Western Isles Natural Heritage Zone (NHZ) including both Stornoway and Pairc." Both Stornoway Wind Power and Comhairle nan Eilean Siar previously lobbied for the Pairc SSE application to be disregarded in future considerations of the cumulative impacts of windfarm projects on Lewis and Harris. A previous application by SSE PLC to build a 205MW windfarm on Pairc Estate, Isle of Lewis, was put before Comhairle nan Eilean Siar in 2007. It was decided to recommend that the Scottish Ministers approve only 26 of turbines. Scottish and Southern Energy submitted an ammended application to build a 26 turbine (94 MW) windfarm on Pairc Estate in Feb 2009. This application was recommended for approval by the Comhairle nan Eilean Siar planning committee on 21 April 2009. SCOTTISH AND SOUTHERN ENERGY (SSE) has revised their proposal and have submitted an application to build a 94 MW, 26 turbine windfarm on the Pairc Estate in south east Lewis. The construction period is estimated at 18 months and will involve 2635 vehicle movements excluding plant delivery. SSE predict that the windfarm will have an adverse impact on the landscape types classified as Knock and Lochan (moderate), Boggy Moorland (moderate) and Rocky Moorland (substantial). SSE predict significant adverse visual impacts are predicted for areas of Gravir (Taobh a Ghlinne) and elevated sections of road through Pairc (B8060 pull-in) , Acha Mor, and Laxay. However the windfarm wil be visible over a wide area of south east Lewis. NB: As yet we have have been unable to locate a cumulative impact assessment for the visual impact of the windfarm in combination with the other windfarms proposed on the island. Pairc Peninsula now holds around 15% of the UK breeding population of White-tailed sea eagles which have recently been reintroduced to the UK after being persecuted to extinction. The area also hosts a number of golden eagle ranges, and is used by immature and visiting birds. In collaboration with RSPB, the local community, has recently added eagle interpretation to the community run Ravenspoint Centre at Kershader (http://www.ravenspoint.net/). Unfortunately the majority of SSE's bird survey work was undertaken between 2003 and 2005, since which time there have been changes particularly in respect of the eagle population, which has expanded significantly almost doubling. Accordingly it is probable that SSE's conclusions underestimate both the magnitude and significance of the winfarms impact. SSE admit that their work has limitations stating “This report does not take into account any changes in species numbers and breeding distribution that may have occurred since the original survey period.” (SSE ES 2009 5.4.6). The following summary figures are derived from the current SSE application. Under planning law SSE are also obliged to provide a 'cumulative impact assessment' which take into account the projected impacts from a windfarm in combination with other projects both in planning and consented. SSE have presented a cumulative assessment but have only included a selection of the island projects; Arnish Moor Wind Cluster, Pentland Road, Monan/North Harris, and Feiriosbhal Windfarm on Eishken Estate. 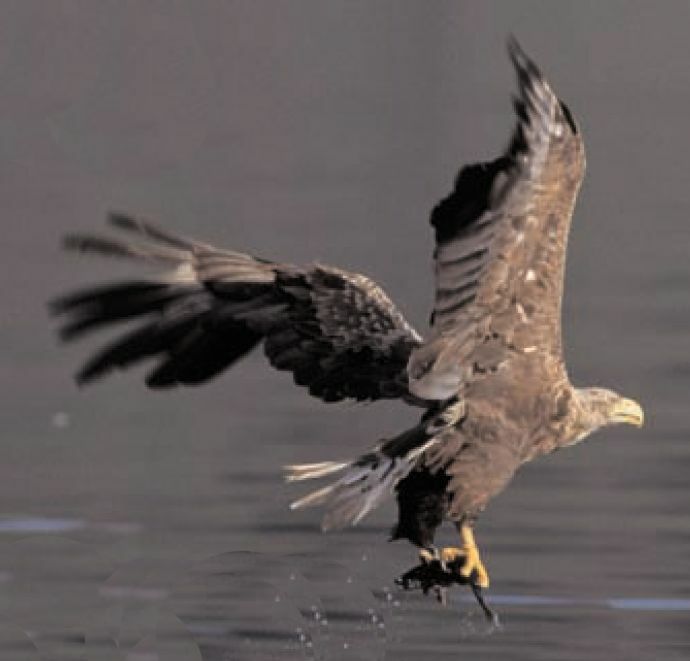 SSE claim that in total these projects could result in approximately 28 eagle deaths and that there will be no adverse impact on the Western Isles Golden eagle population. However, also in planning are 4 smaller schemes which SSE have ignored at least one of which also involves eagle mortality. But most critically, while SSE have included the consented the 13 turbine Feiriosbhal windfarm on the neighboring Eishken Estate, they have ommitted the larger and much more damaging Muaitheabhal Windfarm (in planning), of which Feiriosbhal is a subset. Inclusion of the Muaitheabhal Windfarm turbines would add approximately 6 further Golden Eagle deaths. The Eisken windfarm proposals are located on one of the densest breeding populations of Golden eagles in the UK. The Muaithebhal Windfarm is also the main contributor to the demain for an interconnector to be built to the Western isles. SCOTTISH AND SOUTHERN ENERGY (SSE) has applied to build a 57-turbine (205 MW) windfarm on the Pairc Estate, Isle of Lewis. This, the island’s third major application, would bring the total number of turbines to around 300. It is the second massive windfarm proposed for the Pairc Peninsula.The turbines would be 145 metres (475 ft) high and require concrete foundations, hard standings, 45 kms of road, 88 river crossings, 12 open-cast quarries, three laydown areas and a control building. Even SSE’s own environmental survey results suggest that the site is highly unsuitablefor this scale of industrial development. The area is dominated by EU-protected habitats including blanket bog and wet heaths with complex systems of fragile valley fens; it has over 120 km of watercourses and supports an internationally important otter population; construction poses a significant risk of peatslides, threatening river ecology (including possible Fresh Water Pearl Mussel populations). Several bird species protected by EU laws and known to be at risk from wind power developments use the site. SSE predicts that, over the project’s lifetime it could kill 76 Golden Eagles, 51 Red-throated Divers and 19 Black-throated Divers. As SSE’s bird surveys were conducted before recent increases in White-tailed Sea Eagle numbers, the estimated mortality of two Sea Eagles is likely to be a significant underestimate. Pairc Peninsula now holds 15% of the UK breeding population, and in collaboration with RSPB the local community, has recently added eagle interpretation to the community run Ravenspoint Centre at Kershader (http://www.ravenspoint.net/). SSE predicts the highest level of adverse impact on the landscape character of the Pairc moorland and significant visual impacts on Lewis communities up to 19 km away and on the north-east sector of the South Lewis/North Harris Wild Land Search Area; it would also be highly visible from the north-east of the South Lewis, Harris & North Uist National Scenic Area. The company also plans to land a sub-sea cable (the Ullapool-Beaully line) through the village of Gravir on the east coast of Pairc Estate, to export electricity to the mainland from this and the nearby Eishken windfarm. It would require a 4.25 hectare converter station complex on the edge of this scenic village as well as the transmission lines. Although the formal consultation period for the Pairc windfarm application is now closed, if you wish to object to this proposal you can still send an objection to the Scottish Executive. Should the application be called in for a Public Inquiry it will be up to the Reporters discretion whether to invite people who have submitted late objections to give evidence. However all objections will be logged by the Scottish Executive and count towards the total. Scottish and and Southern Energy have submitted an application to build a 205MW windfarm on Pàirc Estate. The 57 turbines will be a massive 145m (475ft), making them probably the largest onshore turbines in the UK. SSE have not submitted a completed application, they are yet to undertake appropriate noise studies and have not submitted a shadow flicker assessment. The massive turbines will be visible over a large expanse of north-east and central Lewis. SSE report significant visual impacts on communities as far afield as Pabail Uarach, An Cnoc, Garrabost and Aiginis in Point, Col, Sandwick, Achmore, Liùrbost, Rànais as well as visibility from other townships. The developers predict an estimated collision mortality rate of 3.6 Golden Eagles a year - around 75 eagles over the lifetime of the windfarm. The Pàirc Peninsula where this and also the Muaitheabhal windfarm are proposed is also in the top three most important locations in the UK for White-tailed Sea Eagles. SSE also report significant risk of peatslide at 6 locations, the largest of which SSE estimate could have a volume of over 370,000 cubic metres. Copies of the environmental statement including the photomontages, are on display in Stornoway Library, Laxay Post Office, Ravenspoint Centre (Kershader) and Comhairle nan Eilean Siar Office (SY). The consultation period deadline is 26th July 2007, however we have been informed that late objections will still be recorded by the Scottish Executive and may still be considered should a public inquiry be called. Please help us continue to fight these inappropriate and environmentally damaging proposals. A standard letter of objection to the Pàirc Windfarm is available for download either in pdf format (adobe) for printing, or as a Word document which can be submitted by email (either copy and paste text into email or complete and send as attachment). Both versions have space to add you own comments and contain contact details for the Scottish Executive Consents Unit. You are also welcome to base your own objections our standard one. Please make sure you provide your address and the date to ensure that your objection is considered.